Adelina’s is a wine bar and restaurant serving tap wines and craft beers, and Italian home-style cooking. The restaurant’s recipes largely come from owner Toby Buggiani’s family and friends in Italy, from regions and cities such as Tuscany, Venice, Rome and Naples. 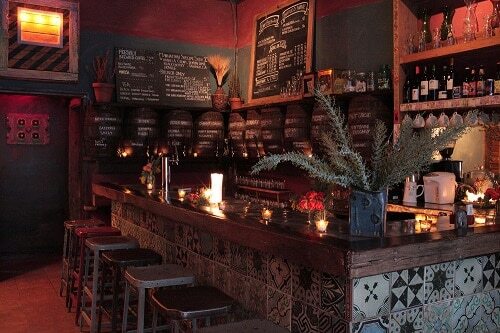 Warm and cozy, the bar is doted with wine barrels and artwork by street artists of 1980s New York. The Tuscan palette of ochres and terracottas with its dim amber glow in evening, exposed brick and murals creates an ambiance of a true blend between contemporary Brooklyn culture and rustic Italian tradition.